After the final curtain nearly fell from hitting a $2 million speed bump last summer, the Arizona Theater Company now appears to be chugging merrily through its 50th anniversary season as if the end was never close. With a big gulp the community realizes what a long, strange journey those 50 years have been. There is the proud history of more than 250 productions showcasing classics by the likes of Shakespeare, Shaw, Moliere and Beckett alongside the works of such contemporary playwrights as Williams, Shepard, Wilson and Fugard. New plays and edgier productions were also in the mix, pushing on the envelope of possibility rather than always depending on theater’s commercial favorites. Then there was the real drama when the company announced last June it would be forced to close immediately if $2 million wasn’t raised within two weeks. Board member and theater angel I. Michael Kasser greeted ATC’s desperate announcement by agreeing to set up a $1 million matching fund if others would add the rest. He did and they did. The mayors of both Tucson and Phoenix got involved and by August the $2 million had been raised. The bullet was dodged and everyone’s pulse went more or less back to normal on the company’s stages in the two cities. Artistic Director David Ira Goldstein agreed to ride out the aftermath of the crisis by staying on for his 25th year as the company’s artistic director. Thanks to their mutual admiration and the 11th-hour recovery, ATC now has a future, as well as a past. “I feel like we have turned the corner, at least for the moment,” Kasser said in October. “What we need to have now is a ‘what’s next’ strategy. But I do believe in the transformative power of the arts. I felt this was my place to take a stand, to do something for Arizona. 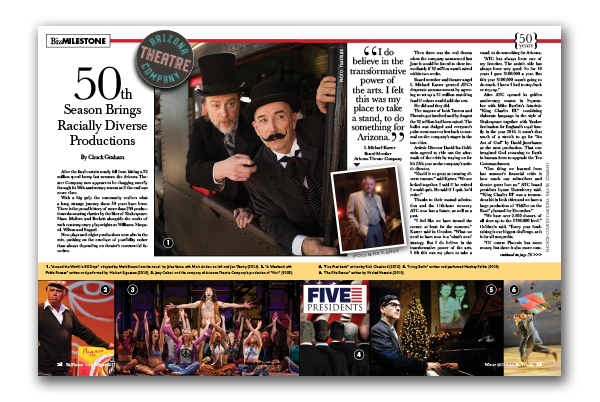 After ATC opened its golden anniversary season in September with Mike Bartlett’s futuristic “King Charles III,” combining elaborate language in the style of Shakespeare together with Yankee fascination for England’s royal family in the year 2016, it wasn’t that much of a stretch to go for “An Act of God” by David Javerbaum as the next production. That one imagined God returning to Earth in human form to upgrade the Ten Commandments. “We have over 2,500 donors, of all sizes up to the $700,000 level,” Goldstein said. “Every year fundraising is our biggest challenge, as it is for all nonprofits. When it comes to buying tickets, Goldstein sees less difference between the two cities. Interestingly, the artistic director thinks that more change has occurred over the last five years in both cities. Goldstein is also proud that his theater seasons have become more racially diverse. ATC has presented “four or five” of August Wilson’s epic plays, and was one of the first regional companies to produce South African playwright Athol Fugard’s works dealing with apartheid. “We have given the National Latino Playwriting Award for 20 years straight,” he added. “Next season we are doing a full production of ‘The River Bride,’ which won that award three years ago. As for the future that almost slipped away, Goldstein is still planning to retire at the end of this season. Dusenberry also notes that ATC’s immediate fundraising goals include an additional $3 million to ensure future solvency. “I don’t expect we’ll have that same kind of financial situation next summer. We do want to be exercising our fiduciary responsibility,” Dusenberry said, sounding like the attorney that she is. Completing the ATC season in Tucson are: “Fiddler on the Roof,” Dec. 3-Dec. 31; “La Esquinita, USA,” Jan. 14-Feb. 4; “Ring of Fire: the Music of Johnny Cash,” March 4-March 25; “Holmes and Watson,” April 15-May 6.